This is great news! I am curious why Amtrak’s website doesn’t have a posting or press release about this. This should be prominently displayed there. I know, seriously. It should be more prominently displayed – including at King Street Station in Seattle, at Union Station in Portland, etc. I know many people already have wifi, but having it on the train will prevent the need for them to continue services that they have solely to have Internet on the train (like I did for about a year and a half between 2006-2007). There are a lot of between city travelers that will really be able to use this! Was there an official notice on this yet? 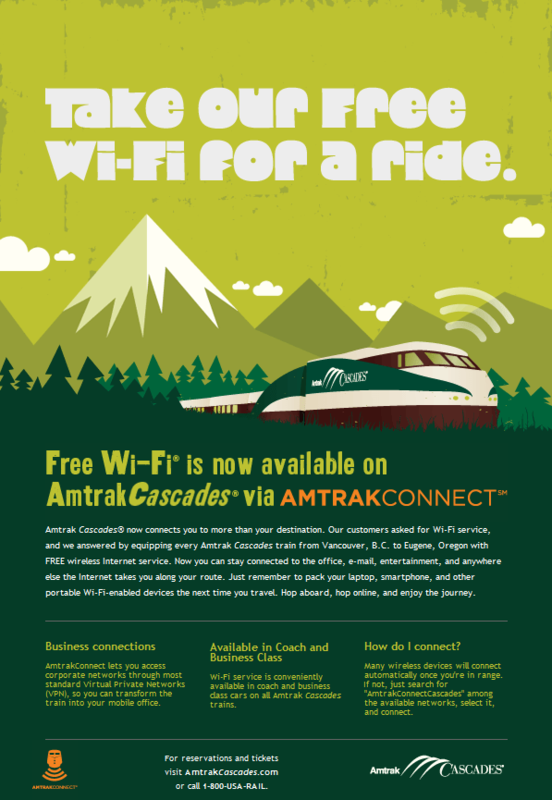 The ad displayed came straight from the Amtrak Cascades/Amtrak Website E-mail Subscription, so I think that’s about as official as it’ll get. I’m pretty stoked! I have a few trips coming up, so it’ll be sweet for the crew & people I’m going with to be able to have access on the train. There is functionally ZERO reason for me to ever drive between Portland and Seattle (or Centralia, Olympia, Tacoma, Tukwila, or Kelso/Longview) every again! I love it! I’m curious how well WiFi works on a train, if there are dropped spots or if the signal degrades with a couple hundred passengers using it at the same time. OT – Adron, your thoughts on “Portlandia”?